Cars Should Be Called Fatmobiles! As most of you know, we made the decision to move back to Portland as renters, living center city, without a car, plunking our children in their neighborhood public schools. And, we made it through last winter, spring soccer, and various summer camps sans vehicle. We were proud. But, as we all know, pride goeth before the fall. Autumn arrived, and school started anew for the Zs, who were to be on two different campuses, playing soccer in two different leagues that called for four separate practices during the week and two to three soccer games every weekend. My parents were kind enough to loan us a vehicle when this crazy schedule began, and we planned to use it just until we worked through our various transportation challenges. We began our brief stint of car possession with earnest promises to ourselves. We super promised each other. But, somewhere along the way, someone must have been crossing their fingers because we learned, the hard way, that when you have a car at your disposal, when it’s parked right downstairs, you opt for efficiency and forget about walking altogether. After less than a month, I am sad to say, we almost had fully regressed to the habits of the car owned. Tom knew we had jumped the shark when he drove the 6 blocks to Hot Lips Pizza to pick up food for the kids one night. Aghast, we called my parents and asked them to take the car back, posthaste. They couldn’t do it for a few weeks, and we were in a panic. No lie, over that month-and-a-half, Tom and I each gained about ten pounds. I am happy to report that we are again car free these days. (Although still very appreciative for the loan, Mom and Dad!) Yes, it is rainy, stormy, misty, and awful out, but we couldn’t be happier to be biking, walking, and streetcarring once more. The photos you see here in this post were taken on recent walks going about my daily routine — not moments one experiences from a car. 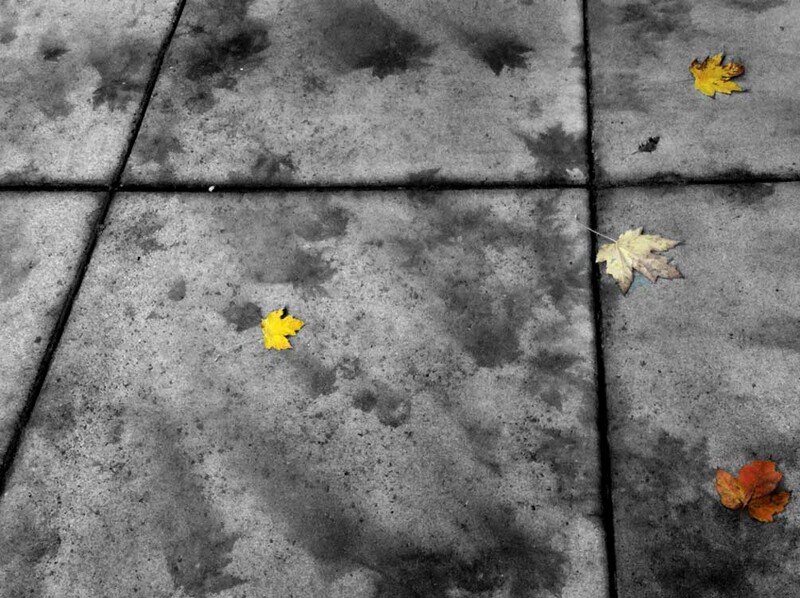 I love the organic imprints left by leaves and rain on the sidewalk, which I snapped on the walk to my gym. 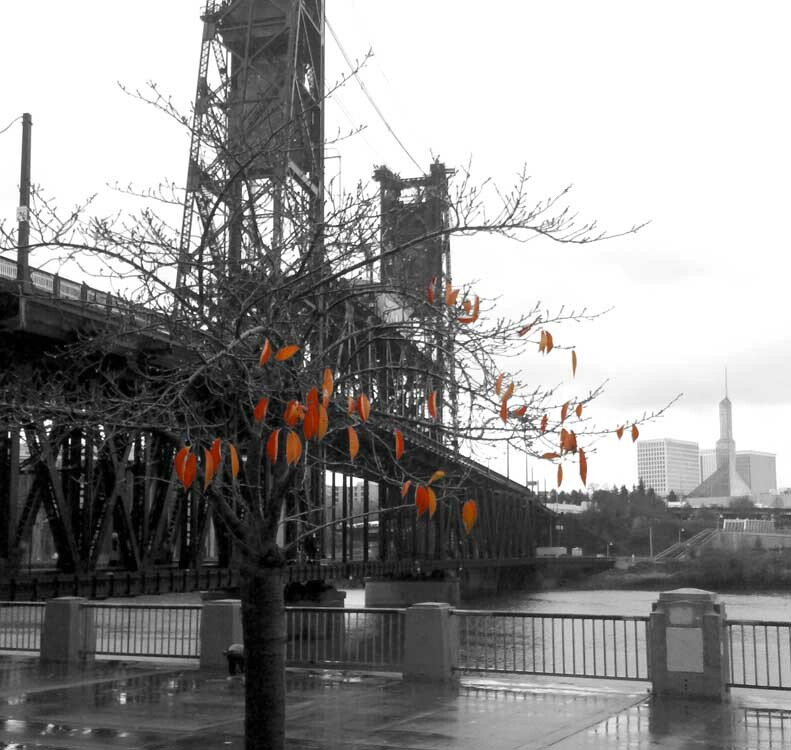 And, this bare little tree with its few bright orange leaves still clinging to branches provided a stunning contrast to the driving wind and rain that marked a recent trek across the Willamette River on the Steel Bridge as I made my way to a work meeting. Truly, it was exhilarating! This entry was posted on Saturday, November 20th, 2010 at 8:34 pm. You can follow any responses to this entry through the RSS 2.0 feed. You can leave a response, or trackback from your own site.